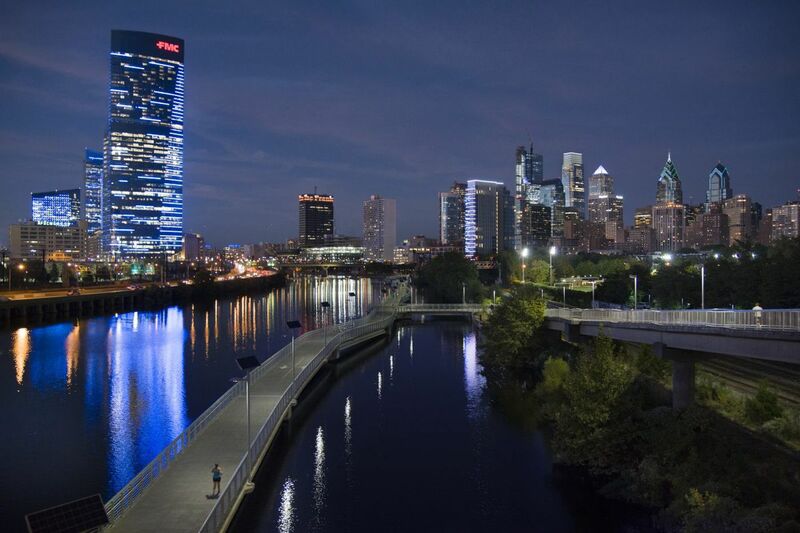 The Philadelphia skyline seen from the South Street Bridge over the Schuylkill River. As the federal government dithered with helping hurricane-racked Puerto Rico, cities like Miami, New York, and Philadelphia were already sending desperately needed relief. They were able to act so quickly partly because they are big enough to have resources, and small enough to scramble quickly. Cities can pick up trash, clean streets, run libraries, and put out fires all at once. And, as they've been faced with a decline of state and federal support, they have worked together with private, governmental, civic, academic, and nonprofit sectors to cover services. Harnessing that innovation — and yes, surprising efficiency — in cities can lead the nation in solving problems of the modern era. Consider that urban problems are reflected in every kind of community in the country. The opioid crisis, gun violence, poverty, affordability and income gaps, educational inequities, and unemployment are not limited to urban areas. But because urban areas are so compact, diverse, and complex, the very people who attack these problems on the streets are close enough to well-resourced institutions they can work with to find answers. Drexel University's Lindy Institute for Urban Innovation wants to push cities' creative agility to the next level by taking advantage of Philadelphia's vast pool of robust civic activists to find problem-solvers it can match with university experts to find the answers to our most vexing issues. The university, which has taken an increasingly high profile in civic affairs, is awarding three fellowships to people who are on fire about cracking urban problems and creative enough to seek interdisciplinary solutions. The application deadline is Oct. 6. As an example of Herculean urban innovation, Lindy director Harris Steinberg notes that New York City dealt with the stifling overcrowding of the late Industrial Revolution by building a subway system that became the envy of the world. It's fitting that a local university is pushing urban innovation in Philadelphia, the home of great ideas like modern democracy, for one. Philadelphia was the first big city to pass a sweetened-beverage tax, which it is using to fix parks, recreation centers, and libraries as well as provide prekindergarten for city children, issues the state and federal governments barely address. It also has found less expensive but nonetheless elegant solutions. It turned filthy, blighted lots into community gardens. That's had the ripple effect of neighbors getting to know each other, taking better care of their homes, and spending more time outside. The result has been a higher quality of life and less crime. In their book The New Localism, Bruce Katz, the Centennial scholar at the Brookings Institution, and Philadelphia's Jeremy Nowak, who created the Reinvestment Fund and is a fellow at Drexel, argue that the power to change resides in cities that are stepping up as the state and federal governments step back. Philadelphia's up to the challenge. Let's see who will come up with the next round of great ideas.